In August 2011, the Ministry for Research and Education launched the initiative „research campus – public-private partnership for innovation”, in order to support in the scope of their Hightech-Strategy a new way of cooperation between science and economy in Germany. The Ministry for Research and Education had 40 to 50 applicants for the formation of research campuses. Ten were selected by an independent jury, one was closed because it wasn’t successful enough and now nine remained. The research campuses are themed for instance at mobility, energy supply, manufacturing technology or widespread diseases. In Berlin for example, the research campus Mobility to Grid is situated on the EUREF campus. They focus on how to incorporate electric vehicles as a part of a smart grid net in Berlin. 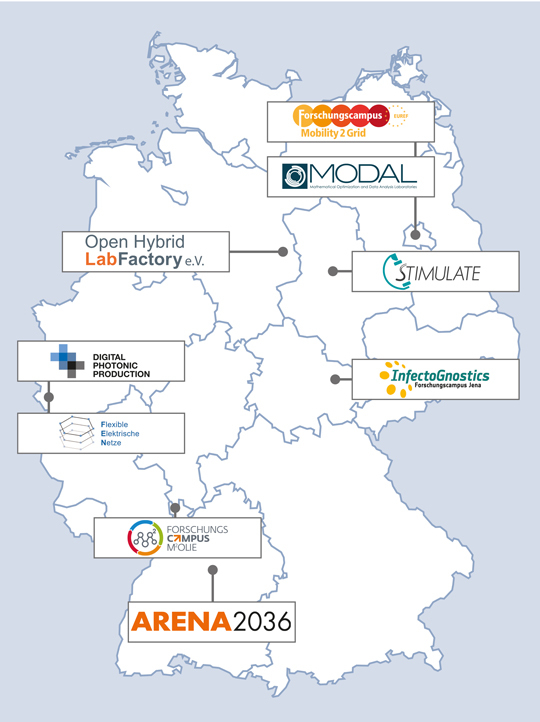 Another research campus in Berlin focuses on developing Big Data tools. Control programs are being optimised which is helpful for processing mass of data. Those programs can be used for example for the scheduling of trains, transport of natural gas through pipes and also diagnosing cancer at an early stage via blood tests. Beyond that, research campuses are engaging in tuition and the training of junior scientific staff to meet the skill shortage. The „backing“ research project Forschungscampus – pro aktiv (research campus – pro active) is realised by the Fraunhofer institute for system and innovation research in Karlsruhe and VDI/VDE (the association of German engineers and electrical engineers). They examine the progress of the research campuses and also support them with evaluations.